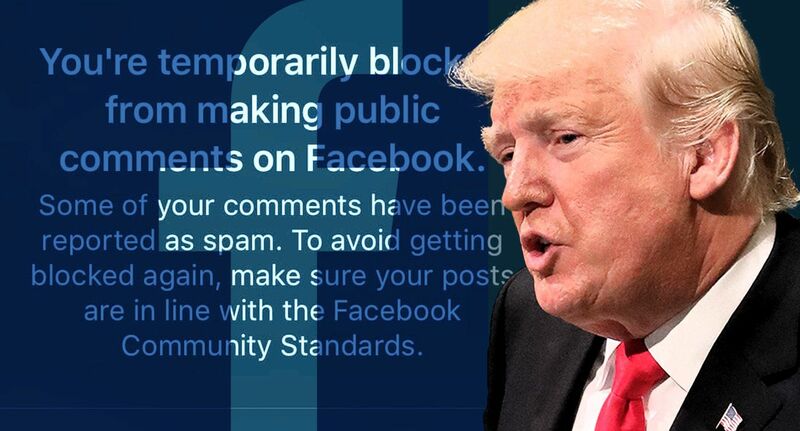 President Trump threatened an investigation into Facebook over perceived bias after a White House staffer was temporarily banned from posting comments on the site. Trump’s social media director, Dan Scavino, complained Monday that Facebook had banned him from posting comments. Scavino’s account was temporarily blocked from posting comments (although not new original posts) because previous messages had been reported as spam. White House aide Dan Scavino listens and films as President Donald Trump speaks during an executive order signing ceremony regarding trade in the Oval Office of the White House in Washington, DC on Friday, March. 31, 2017. Dan Scavino and Kellyanne Conway, aides to President Donald J. Trump, are seen on the West Front of the Capitol after Trump was sworn in as the 45th President of the United States, January 20, 2017. White House Press Secretary Sean Spicer, left, and assistant to the president and director of White House social media Dan Scavino, center, and Mike Dubke, White House communications director, listen during a joint press conference with NATO Secretary General Jens Stoltenberg and US President Donald Trump in the East RoomPresident Donald Trump and NATO Secretary General Jens Stoltenberg participate in a news conference in the East Room of the White House in Washington, DC on Wednesday, April 12, 2017. Dan Scavino Jr., White House director of social media, right, speaks with Sean Spicer, White House press secretary, outside the Oval Office of the White House in Washington, D.C., U.S., on Wednesday, May 17, 2017. Republican leaders were still pitching their plans to overhaul the health-care system and tax code Wednesday, despite a steady stream of chaos from the White House. White House Director of Oval Office Operations Keith Schiller (L) and White House Director of Social Media Dan Scavino arrive to meet Pope Francis, May 24, 2017. White House Press Secretary Sean Spicer (L) and social media director Dan Scavino Jr. stand outside the Oval Office of the White House upon President Donald Trump's return to Washington, U.S., May 17, 2017. White House staff members Deputy National Security Adviser K.T. McFarland (L), Senior Advisor Stephen Miller (2nd L) and White House Director of Social Media Dan Scavino (3rd L) arrive with U.S. President Donald Trump (not pictured) as he returns from a weekend at his New Jersey golf estate home via Air Force One at Joint Base Andrews, Maryland, U.S. May 7, 2017. A Facebook spokesperson told Yahoo News that a system intended to stop bots had temporarily halted Scavino’s ability to post comments, and that the company had apologized and restored his account. Rep. Devin Nunes, R-Calif., a Trump ally who was chair of the House Intelligence Committee until January, filed a $250 million lawsuit against Twitter on Monday over what he described as “abusive, hateful and defamatory” content, including from parody accounts under the names of “DevinNunesMom” and “DevinNunesCow.” The Cow account has gained over 100,000 followers since Nunes announced the lawsuit. Trump said in November that his administration would look into Facebook, Google and Amazon for potential antitrust violations. Tech companies and their treatment of conservative content has been an important cause for the president’s son, Donald Trump Jr., who targeted Instagram, which is owned by Facebook, accusing it of “deboosting” conservative posts. In 2016, Gizmodo reported that Facebook had suppressed conservative news stories. Facebook’s reputation has declined precipitously over the last year amid a number of controversies, including data privacy. However Facebook, which was a key element of Trump’s 2016 campaign, has not silenced pro-Trump messages. A study released last week found that the most popular publisher on Facebook over the last year was Fox News, a network that is closely associated with and extremely supportive of the White House. The sixth most popular site was Daily Wire, a conservative outlet. The Trump 2020 campaign has been very visible on Facebook as well. Trump’s reelection campaign spent $3.5 million on the platform between Dec. 30, 2018, and March 10, far more than any of the Democratic contenders, and more on Google than any of its rivals during that period.